The TRC submitted 12 changes to Jefferson County’s draft commercial shooting range ordinance. The effort thus far is a good start, but fails to meet the goals outlined in the Moratorium Ordinance. The draft ordinance needs to be strengthened to protect people, places, and property. Limit on number of firing points. Environmental testing to establish pre-operation baseline. Nuisances noise defined and prohibited. Retention of existing no-shooting areas. Military and law enforcement certification. These changes will strengthen environmental protection through soil and water testing, and improve safety through limits on the intensity of shooting. Our changes provide for more public involvement through notice and comment, will eliminate dangerous operational practices, and will reduce nuisance noise levels. Read the entire TRC response. The Board of County Commissioners (BoCC) voted in December 2017 to declare a one-year moratorium on considering applications for commercial shooting facilities. The moratorium ordinance created a committee charged with developing draft legislation regulating commercial shooting ranges. The goal of this proposed ordinance was to protect the viability of gun ranges in the face of increasing population pressure with a focus on public safety, environmental protection, and compatible land use. The moratorium ordinance referenced recent legislation on the regulation of gun ranges from Kitsap County, which has withstood legal challenge, as a model. 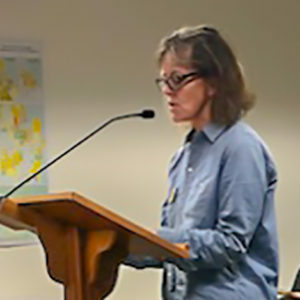 The review committee consisted of County Prosecutor Phil Hunsucker, County staff from DCD, the Sheriff’s office, and Environmental Health, representatives of the Sportsman’s Club and the Point-No-Point Treaty Council, a citizen from each of the three legislative districts, and Joe D’Amico of Fort Discovery Inc. as a citizen-at-large. The committee met 15 times during the summer of 2018 and Mr. Hunsucker presented the draft ordinance, encapsulated in the bulleted points below, to the BoCC on August 27, 2018. • It requires that the owner of a commercial shooting facility obtain an operating permit issued by the Department of Community Development (DCD). The permit requires a pre-operations inspection, an annual report, and an annual inspection, and enables inspections after reports of noncompliance. • The application for an operating permit includes subsections with plans for facility design, safety, operations, environmental protection, and noise abatement. The application is to include professional evaluation and certification based on relevant Best Management Practices (BMPs) published by federal agencies, and range design and operations guidelines from the National Rifle Association (NRA). Throughout the moratorium committee’s work, Mr. Hunsucker focused the legislation exclusively on public safety, with the explicit goal of producing an ordinance that would withstand legal challenge. As a result, the draft does not address several points that were directly addressed in the Kitsap County ordinance, or that have been raised by concerned citizens. • It does not address environmental protection, other than the requirement for BMPs with respect to lead clean-up in the environmental plan. All other impacts on the environment are deferred to the possibility of a SEPA process during application review Specifically, there are no set-backs from shorelines as required by the Kitsap County ordinance. Setbacks are important for public safety and enjoyment of lakes for swimming, boating, and fishing. • It makes commercial gun ranges available for “organizational training for members of the armed forces.” Thus, gun ranges in Jefferson County could be used for tactical training by military units, instead of being restricted to use by citizens and local law enforcement officers. • It includes a provision that reads, “Full compliance with an operating permit creates a rebuttable presumption that the commercial shooting facility is not being operated as a nuisance.” This sentence appears to prevent nuisance noise complaints from citizens with PTSD or other special circumstances, which are allowable under state law—even though gun ranges are exempt from maximum decibel regulations. • There are no limits on the number of shooters or intensity of shooting. • It does not require operators to pay the costs of permit review—going so far as to explicitly require the county to pay for the cost of hiring an expert on gun-range design and safety to review applications. • It does not address compatible land use with surrounding areas. All land-use implications are deferred to existing code requirements, which are not designed to deal with the unique impacts of gun ranges. • It does not allow anonymous complaints of violations, exposing whistleblowers to potential harassment. • Instead of being focused on the responsible and safe use of firearms by hunters and law enforcement officers, it allows exotic uses such as exploding targets and cowboy action shooting—a type of “running and gunning” contest. • Extending the moratorium to allow further study and/or input on land-use implications from the Planning Commission. Public hearing scheduled! Mark your calendars for September 24. After weeks of meetings the moratorium committee has now submitted the draft Ordinance on Commercial Shooting Facilities, designed to guide the county on regulating gun ranges in the county. The TRC has concerns about the current draft and would like to educate our supporters about how they can have their voices heard. We just learned that the evening for public comments is September 24. Please mark your calendars. More will be coming to you about our concerns and suggestions for those who, like us, want to keep gun ranges safe for residents, respectful of the environment and appropriate for a county that champions the best a rural area has to offer. stop by our TRC table from 9:00 – 4:00 at the Quilcene Picnic and Parade this Saturday, September 8th where you can pick up information, buttons, yard signs, etc. join us on September 12 at 6:30 PM at the Laurel B. Johnson Community Center, 923 Hazel Point Road at the end of the Coyle where we will discuss the situation, take questions and outline ways you can have your voice heard about this critical issue. It’s very important that we have tons of community input to influence the final version of this ordinance. Stay tuned for a detailed account summarizing the ordinance and sharpen your pencils for the upcoming comment period. We’ve just received another shipment of TRC yard signs (and this time with our web address on them). Given that they tend to “disappear” we recommend people nail them into trees (if your trees are game) a little higher than is convenient to remove, or stake them on private property, ideally where there isn’t an easy pull-over. If you’d like one (or more), send an email to info@tarbooridgecoalition.org and we’ll figure out where you can pick them up. Again: would like to see tons of these signs around to remind the commissioners just how many people care deeply about this issue. https://tarbooridgecoalition.org/wp-content/uploads/2018/02/logo_tarboo_banner-1-300x101-300x101.png 0 0 sitereviewer https://tarbooridgecoalition.org/wp-content/uploads/2018/02/logo_tarboo_banner-1-300x101-300x101.png sitereviewer2018-09-05 19:50:152018-09-05 19:50:15Public hearing scheduled! Mark your calendars for September 24. The Commercial Shooting Range Review Committee (CSFRC) will soon forward their recommendations to you. We expect and hope the recommendations will be at least as thorough and enforceable as those in Kitsap County. If not, you can expect that all the adverse consequences of private, for profit shooting facilities that Kitsap County has avoided, will be transferred to Jefferson County. If they can’t do it there–they’ll come here. Kitsap County, with some caveats, prohibits a shooting range from being used to train units of any branch of the United States military. We think it does not go far enough, and that Jefferson County’s ordinance should outright prohibit any and all military training at private for profit commercial shooting facilities. Military training should take place at military installations. It was military training at Fort Discovery that resulted in the expanded use and the substantial increase in noise and other adverse issues that only abated with the cancellation of SSNW’s lease on the property. The unpermitted activity continued for over a decade not withstanding Jefferson County’s best efforts to bring the facility into compliance. The military often cites national security for keeping their activity secret and excluding public access. Allowing military training at private facilities will remove or severely hamper local control and the ability to enforce the conditional use permit. Just a sampling of the crowd at our August 5th Peace Feast. The TRC Peace Feast, held at the site of Concerts in the Barn on Sunday, August 6th, was a living, breathing example of what we love most about Jefferson County: great people, great food, and a vision for what a thriving rural community can be. The 150+ attendees, ranging in age from 6 months to 91 years, ate an enticing selection of salads, main dishes, and desserts along with Egg & I pork prepared by the masterful Doyle Yancy. We played croquet, badminton, and horseshoes, we rode the magical Legends of the Forest Carousel presented by TRC Board President Peter Newland, and—most important—we learned more about TRC’s mission and the threat that a proposed paramilitary training complex poses to the values that we as a community hold dear. When the feasting was done, we gathered in the Festival’s 1900-vintage barn to hear Dmitri Iglitzin, Sarah Spaeth, Peter Bahls, and Peter Newland review the almost 20-year effort to restore the Tarboo Creek watershed, and the “fish, farms, forests, and families” vision that TRC and a host of private citizens and organizations are promoting for Jefferson County. 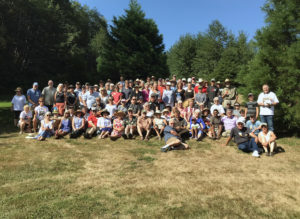 After a lovely concert by Mark Pearson and Ted Brancato, we gathered for a group photo, gathered empty food containers, connected one last time with friends and relatives, and signed in to TRC’s email list—ready to respond to new information about how to support the mission. What a great day, and what a great community. • And the team who gathered at Old Tarboo Farm to make all those bouquets. “Nobody lives there.” We disagree! There are those that believe the area adjacent to Tarboo Lake is a good place for a paramilitary weapons training camp because “nobody lives there.” We beg to differ. An estimated 350 families live within a 3 mile radius of this proposed facility and, if it were to be approved, would listen 6 – 7 days a week to relentless gun fire and helicopters landing. It’s time for you to meet some of them. 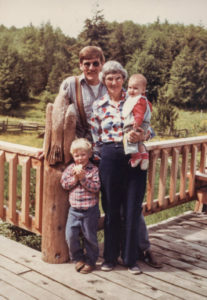 Here’s a picture of Bob Richardson, his mother, oldest son and youngest daughter in 1974 at the house he built on his property off Eaglemount Road. Bob grew up in the Bremerton area. 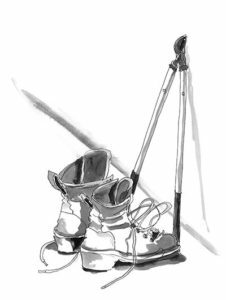 His first camping trip when he was 11 was up the Dosewallips, a trip that forever sealed his love of our area. A conscientious objector of the Vietnam War, Bob worked as a social worker instead in LA County with drug addicts and alcoholics. When his service time was over he returned to live in Quilcene. The year was 1971 and he got his first job as a logger with Buck Mountain Logging. 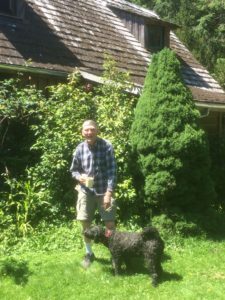 Finding the property at Eaglemount was a dream come true: acreage, a winter creek, a big pond, half a million feet of standing timber and a sweet deal from the owner that allowed him a lease to own. He bought a sawmill and cut the timber for the house he lives in today. Bob learned early that to make a living in this area he needed to put together as many jobs as he could. He started a dog kennel, continued his work as a sawyer and made money as a musician. They paid off the property in 1993. He’s raised four children there – two were born upstairs in the house. Here’s Bob again in 2018 still there, same house. TRC couldn’t agree more with you, Bob. https://tarbooridgecoalition.org/wp-content/uploads/2018/02/logo_tarboo_banner-1-300x101-300x101.png 0 0 sitereviewer https://tarbooridgecoalition.org/wp-content/uploads/2018/02/logo_tarboo_banner-1-300x101-300x101.png sitereviewer2018-07-22 20:56:512018-07-23 23:34:20"Nobody lives there." We disagree! If we ran a contest to create a motto for Tarboo Creek, I’d nominate a passage from Luke 4:24: “no prophet is accepted in his hometown.” Just seven and a half miles long from tip to tail; reduced to flows of a mere two cubic feet per second in the height of the mid-summer drought; ditched, drained, and degraded for decades. When you live and work in Jefferson County, it’s easy to forget just how special this little stream is. In 2003, Peter Bahls and Jude Rubin of Northwest Watershed Institute (NWI) in PortTownsend set Tarboo Creek on a course th at has led it to national prominence. The work started with replacing failed culverts that were blocking salmon passage up the stream, under Center Road and through the Olympic Music Festival. In 2004 NWI partnered with our family to complete the first of what has turned out to be many re-meandering projects: bringing in excavators, dump trucks, and volunteers to pull the creek out of a series of deep ditches and into the sinuous meanders of a natural streamcourse. In January of 2005, NWI organized the first of what have come to be annual plant-a-thons: all-day tree-planting parties powered by shovel-wielding schoolchildren and their parents. The kids sell plant-a-thon coupons as a fundraiser for their schools, pledging to plant a tree in commemoration of a loved one or life event. In return, the Tarboo Creek watershed gets trees: lots of them. That first year, about 125 volunteers planted 3000 trees and shrubs along our newly re-meandered stretch of stream. Thirteen years later, Jude’s tally is that over 1000 volunteers have planted over 30,000 trees on over 200 acres. Virtually the entire valley has now been reforested. It’s the little stream that could: come back, host spawning salmon, inspire kids to care about the land around them, serve as a national model of community-based conservation, and yes, be a prophet in our own hometown. Saving Tarboo Creek by Scott Freeman, with illustrations by Susan Leopold Freeman; Timber Press, 2018. “I’m here this morning representing the Tarboo Ridge Coalition, a community group opposed to locating a paramilitary gun complex on the shores of Tarboo Lake. Over 200 of our supporters attended the moratorium hearing on new commercial shooting facilities and we are monitoring the committee’s progress. The moratorium, in effect, acknowledges that the current regulatory system is broken. Relying solely on conditional use permits to regulate gun ranges has proven to be a time-consuming failure, and a great monetary burden on Jefferson County taxpayers. We need to learn from over a decade of adverse experience and require an operating permit in addition to any conditional use permit. Why does TRC take this position? Since 2005, despite numerous complaints and requests, the Fort Discovery range in Gardiner owned and operated by Security Services Northwest continuously violated the terms of its conditional use permit and disregarded County building codes. The facility was only quieted in 2017 when the ARK Group, SSNW’s landlord, terminated the lease and sought injunctive relief in Jefferson County Superior Court. Twelve years is way too long to expect a disruptive force in the neighborhood to be brought into compliance or shut down. Other jurisdictions have found part of the answer: it is called an “operating permit”. Operating permits spell out the design details of gun range construction and the operational rules. They require operators to annually demonstrate compliance. Operating permits allow government to quickly assess complaints and, if warranted, order a suspension of firing. An operating permit is essential and definitely in the public interest. Applicants for an operating permit should be required to pass a rigorous FBI background check. The ordinance should define what circumstances would prevent the issuance of an operating permit. Part of that evaluation could include the previous compliance history of the applicant. https://tarbooridgecoalition.org/wp-content/uploads/2018/02/logo_tarboo_banner-1-300x101-300x101.png 0 0 sitereviewer https://tarbooridgecoalition.org/wp-content/uploads/2018/02/logo_tarboo_banner-1-300x101-300x101.png sitereviewer2018-06-22 13:46:142018-06-22 13:46:14Yes to Operating Permits! And what about those moratorium meetings? People in this county breathed a sigh of relief when our commissioners declared a year-long moratorium on new gun range permits last December. It was the right time to consider what policies need to be in place when issuing permits.The current guidelines are not sufficient for the county to make responsible decisions around these sensitive issues, particularly with the changing weaponry and the growing population of our county. The Jefferson County Sportsmen’s Association (JCSA), operating on county property near Port Townsend since 1962, has an operating agreement with the county that is up for renewal in 2025. A pre-application has has been made by Clallam County resident Joe D’Amico for an extensive for-profit para-military style training facility on the shores of Tarboo Lake, a lake used for generations by families and fisherman alike. The Tarboo Ridge Coalition has been formed to stop this training facility from coming into existence, believing strongly that a camp of this nature is not appropriate in this location, if anywhere in Jefferson County. The TRC has representation on the Committee. After four meetings, it is clear that there are many competing interests. It remains to be seen if they will be able to come to any majority agreement. The meetings are being taped and are available to the public on the Jefferson County website under AV Capture. Our goal at TRC is to show that a paramilitary shooting facility at Tarboo Lake would be harmful to the environment and destroy the enjoyment of the lake by the Community for generations to come. the new ordinance will be drafted by county employees, not the Committee, presumably reflecting the input of the Committee. Given the Committee is divided in so many ways, this will certainly be a challenge. Please keep an eye on the Moratorium meetings. There is a great deal of work for the committee to accomplish in a short amount of time and we want to be ready to respond as needed when the draft ordinance is ready to go to the commissioners. This is about all of us in Jefferson County and how to create safe places for gun practice while preserving our peaceful, rural communities. https://tarbooridgecoalition.org/wp-content/uploads/2018/02/logo_tarboo_banner-1-300x101-300x101.png 0 0 sitereviewer https://tarbooridgecoalition.org/wp-content/uploads/2018/02/logo_tarboo_banner-1-300x101-300x101.png sitereviewer2018-06-09 04:32:152018-06-10 15:02:30And what about those moratorium meetings? What have Joe D’Amico and his attorney been doing lately? Two “Claims for Damages” against Jefferson County totaling $101 million dollars–one claim for $100 million and another for $1 million. These include hundreds of thousands of dollars in attorney’s fees. Why does Mr. D’Amico bring or threaten to bring so many claims and lawsuits? Does this seem like the work of someone who supports the betterment of Jefferson County, given that for every dollar that the county must spend responding to Mr. D’Amico is money taken away from community needs? Is Mr. D’Amico trying to get the taxpayers of Jefferson County to help make his payroll? There are a lot of questions. Letters to individuals from Mr. Greg Overstreet, Security Services Northwest, Inc.
Press Release regarding Greg Overstreet’s employment 18 Sept 2017 posted on Security Services Northwest, Inc. Facebook page. https://tarbooridgecoalition.org/wp-content/uploads/2018/02/logo_tarboo_banner-1-300x101-300x101.png 0 0 sitereviewer https://tarbooridgecoalition.org/wp-content/uploads/2018/02/logo_tarboo_banner-1-300x101-300x101.png sitereviewer2018-05-24 21:03:562018-05-24 21:03:56What have Joe D’Amico and his attorney been doing lately?